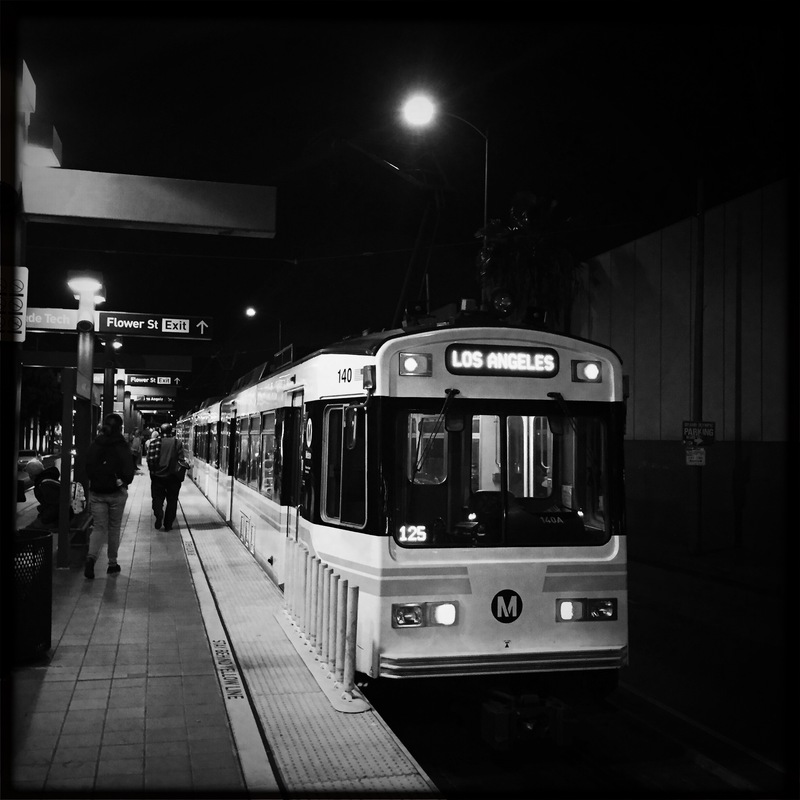 ART OF TRANSIT: The Blue Line last night in glorious black and white. Photo by Steve Hymon/Metro. As you may have heard, the engineer of the Metrolink train involved in the crash last Tuesday passed away this morning. Metro sends its condolences to his family and colleagues at Metrolink. The engineer tried to slow the train before it struck a pickup truck and trailer that a man had driven onto the tracks in Oxnard before getting stuck. The LAT story gets to the core issue and culminates a very strong week of reporting on the Metrolink accident. As the article notes, 36 of the state’s most accident-prone intersections are in the five county area served by Metrolink commuter trains but spending in those counties has been wildly uneven. While Orange County has spent $1 billion since 2005 on making grade crossings safer, Ventura County has only spent $18 million — a direct result of not having a dedicated transportation tax that residents pay in other counties. In the San Fernando Valley, Metro officials are helping fund improvements to nine at-grade crossings on the L.A. County portion of Metrolink’s line that heads to Ventura County. The upgrades include street medians to better control traffic, so-called four-quad arms that lower and block all lanes on both sides of passing trains and separate sidewalk gates designed to keep pedestrians out of harm’s way. Metro also is preparing to hire a consultant in the weeks ahead to analyze all its crossings and determine which are the most dangerous, factoring in previous crashes and near-misses, said Don Sepulveda, the agency’s executive officer for regional rail. “Grade crossings are important to communities because in many cases, it’s their only contact with the railroad,” Sepulveda said. The article also points out that not all rail crossings necessarily need to be completely grade separated. Studies have found that rail crossings with quad gates — that is, they block all lanes of traffic from the traffic — have fewer collisions than those with only gates that block traffic in the right-hand lanes. As we noted last week, Metro is one of the five country transportation agencies that funds Metrolink commuter rail. On the subject of transportation taxes…..a forum was held last week to discuss a possible countywide measure for the 2016 ballot to raise more transportation funds. Proponents in the San Fernando Valley are saying such a measure could be the chance to fund a variety of transit projects in the Valley, which they say has been overlooked in past measures. As I’ve noted here in the past, Metro is certainly looking at a possible ballot measure but the Metro Board has NOT decided to go forward with anything yet — nor do we know yet what form the ballot measure would take (i.e. whether it’s a new sales tax increase or continuation of Measure R, for example). The article mentions several transit projects, including two that are due to receive some Measure R funding — the Sepulveda Pass Transit Corridor and the East San Fernando Valley Transit Corridor — although R doesn’t supply enough dollars to build expensive rail options. Other projects mentioned include converting the Orange Line to rail and extending the Red Line from NoHo to Bob Hope Airport and then back south to Union Station via Glendale and a rail line between the Orange/Red Line and the Gold Line in Pasadena along the 134 freeway corridor. All are interesting in their own way. The policy question is whether a ballot measure could fund all of them. A new study by the San Francisco MTA — which runs buses, light rail and cable cars in the city of San Francisco — has found that slightly more than half of all trips in 2012 and 2013 were by transit, foot, bike or various car share and ride share options. Earlier studies suggest that perhaps the number of trips taken by private vehicles has declined in the past few years. My three cents: if I was The King, I would order my Royal Secretaries to boost transit ridership by boosting population density near transit! Related: Streetsblog L.A. offers up an interesting retort to the LAT article, arguing that it depends how you measure such things — and that central L.A. isn’t much different than S.F. in terms of population density and transit ridership and such. But the reality is that the glory days of personal ownership and operation of a single-occupancy automobile in Southern California are behind us even if WeHo doesn’t develop another thing, and we need to think of a transportation vision that includes not only cars, but multi-modes of transportation to/from and within West Hollywood. Speaking of….Zocalo Public Square in partnership with Metro is holding a forum at 7:30 p.m. on Wednesday, March 11, at MOCA in DTLA on the state of car culture in our neck of the woods. Please click here for more details. And since we’re on the subject of infrastructure today in its various forms….John Oliver does a 21-minute segment on his HBO show dedicated to aging/failing infrastructure in the United States and the political inability to fix things such as bridges and dams. I thought the segment was funny and insightful and now I want a sausage sandwich. The segment is also filled with adult language, adult humor and other things that some may very offensive. You’ve been warned! Upcoming Zocalo Public Square event: is car culture dead? Thank you for including me in the Headlines today. Much appreciated. There is a special election coming up in West Hollywood for an open seat. Maybe be can change the tenor and topic of discussion in time for that. SBLA kinda debunked that SF article today: it’s kinda misleading to compare 50-sqmi SF vs 500-sqmi LA City vs 5000-sqmi LA County. I added SBLA retort to the post. I thought LAT story was fair — if nothing else the data may suggest that driving in city of SF may be going down, which is kinda interesting. That said, my experience is that rush hour traffic in the SF Bay metro area is every bit as bad as parts of our region. Wow that Daily News article couldn’t have been much more skewed, could it? We need to not be coddling the revisionist fantasies of the SFV in advance of the ballot measure and we’re off to a poor start. Redoing the Orange line from scratch should be out. The line is a fantastic success by every measure and can be made better (as a bus). There are way too many projects more deserving of funding than to spend another few billion on something that’s not broke. MoveLA is honestly getting too much leeway to drive the discourse surrounding this. Official or not, they are setting up baseline expectations that will be hard to undo. Metro needs to announce this measure sooner rather than later so they can take over in that regard and Steve doesn’t have to slap a disclaimer on his posts every day. I get that, and I’m sure most regular readers here do as well. But for the general public, including those at the meeting the daily news was covering, Metro is losing out on the opportunity to set initial expectations for the *potential ballot measure. That’s a big deal. Voters get attached to things they think someone has promised them and react viscerally when those ideas are rescinded. Also, it should be said that the presence of a metro board member at this very meeting doesn’t do much to support Metro’s goal of drawing a hard and fast line in the public’s mind between MoveLA’s strawman and a future ballot measure, if that is Metro’s intention. Your point is very well taken — didn’t mean previously reply to imply otherwise. What fantasies are coddled by building light rail to Azusa? San Francisco is the least friendly towards privately owned motor vehicles. Can’t make a left on to Market so go around the block and find out you can’t make a right there too. But you still can’t make a left or right turn legaly with a scooter. Did anyone notice that Montebello Bus Lines now has real-time bus arrival information on their website, http://www.RideMBL.com?